A bipartisan vote in favor of digital democracy in the Senate signals that the fight for a free and open Internet is far from finished. In the fight for the future of media and democracy, the US Senate’s vote Wednesday to restore net neutrality ranks as a major victory. It is not the final victory, mind you, but the bipartisan vote to overturn the Trump administration’s assault on the first amendment of the Internet signals that this fight can and will be won. By a wider than expected 52-47 margin, senators rejected the decision of Donald Trump’s Federal Communications Commission to gut protections for a free and open Internet. The vote assured that the debate about net neutrality—which the Trump administration and its allies had hoped to end with the FCC decision last November—will be central to 2018 contests for control of the Congress. Getting a similar result in the House will be harder. Speaker Paul Ryan, R-Wisconsin, and his majority caucus are rigidly pro-corporate; they will erect every possible roadblock. But if Democrats take the House this fall, Democratic leader Nancy Pelosi has indicated that she is prepared to put net neutrality on the agenda. If both the House and Senate vote to overturn the FCC decision, that will focus attention squarely on the White House—putting pressure on the president to reconsider and, if he does not, assuring that net neutrality will be an issue in the 2020 presidential election. Wednesday’s Senate vote was a blow to Majority Leader Mitch McConnell and Republican congressional leaders. They have worked hard to defend the FCC’s decision to eliminate net neutrality and hand off the Internet to telecommunications corporations that want to create fast lanes for paying content and slow lanes for everyone else. There is no popular support for the change. But the special-interest money that will flow to Republicans who side with the FCC will be so substantial that GOP strategists have been betting the party’s candidates in key House and Senate races will come out ahead. That could turn out to be the worst bet of 2018. Democrats have indicated that they are ready to make net neutrality a 2018 campaign issue. If they follow through, the potential for drawing a new generation of tech-savvy voters to the polls will increase. And Democratic congressional leaders are well aware that those voters could tip vital local, state and national races this fall. Republicans who have sided with the telecommunications industry and against consumers are already feeling heat from Democrats who promise to vote for a free and open Internet. In Texas, for instance, Congressman Beto O’Rourke has made support for net neutrality central to his challenge to Republican Senator Ted Cruz. If enough candidates make net neutrality an issue, and if enough of them win, Democrats could use strong congressional votes, and aggressive negotiations with the administration, to tilt the balance back toward digital democracy. Such a result might have seemed unimaginable just a few months ago. 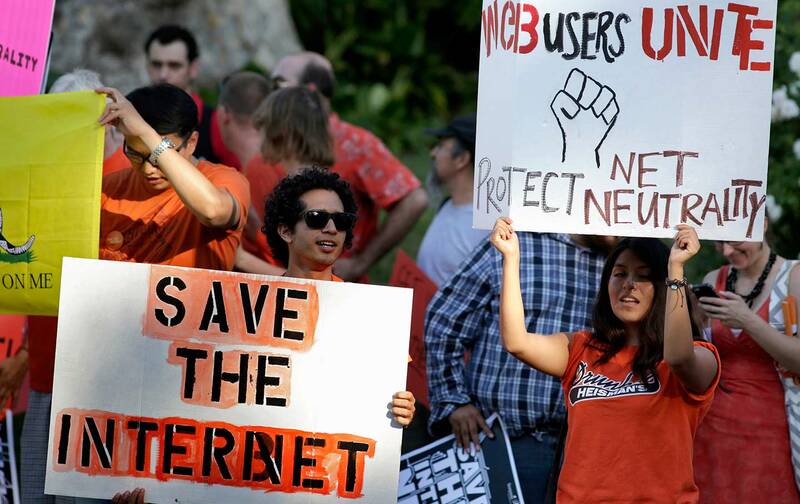 But with the Senate vote, there is a renewed sense of optimism among net neutrality advocates.